Where we come from does not matter. What matters is where we reach by means of our virtues. It is particularly true about Nelson Mandela, a mighty voice of protest against oppression, a Gandhian at heart, a born leader for the deprived, a spirit of rebellion against racism and a fighter against the apartheid government. 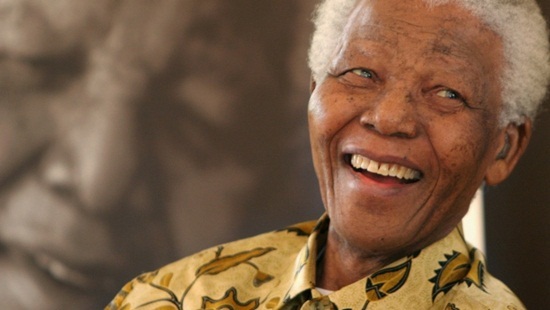 Nelson Mandelas life is full of so many events that summing it up in an article would be a futile effort. He is often called the Gandhi of South Africa because of his human values, inspired by Mahatma Gandhi. He shared a strong apolitical bond with India and Gandhi though neither his life nor his existence was rooted in the soil of India. Indian Eagle makes a small effort to explore his relations with India and the Mahatma. The Gandhian philosophy was one of the driving forces behind Nelson Mandelas lifelong anti-apartheid movement. He admired Mahatma Gandhi as his role model. He was a diehard follower of Gandhis principles Truth and Nonviolence. He was honored with the Bharat Ratna soon after his release from imprisonment in the year 1990. He was the first non-Indian to have been conferred with Indias highest civilian honor. We would like to illustrate Nelson Mandelas ardent devotion for Mahatma Gandhi by summing up one of his quotes about the latter. At the inaugural ceremony of Gandhi Memorial in South Africa in 1993, he had said that the Mahatma is an inseparable part of the African history of movement against the racist in South Africa where he left an indelible influence of his unflinching determination in defiance of the wrong, in support of the right and in pursuit of justice for the non-white, through his philosophy of truth and nonviolence. After as many as 27 years of imprisonment for his protest the apartheid government of South Africa, Nelson Mandela maintained a healthy relation with India and Indian leaders. He is a mighty inspirational and admirable figure like the noble sons of Mother India to Indians of the 21st century. His political and apolitical pursuits to secure peace and justice for the black Africans were greatly influenced by Gandhi’s teachings, which brought him the International Gandhi Peace Prize in the year 2001. Nelson Mandela considered his visit to India as a pilgrimage. India was a land of ideals and values to this greatest anti-apartheid icon. During his travel in India, he visited where Gandhi had worked on his self-help ideas and shaped up his nonviolence principle after his return from South Africa to India, in Ahmedabad. In one of his speeches, Mandela said that he could never achieve the height of humanity, the greatness of truth and the value of simplicity that the Mahatma had set through practical examples in his life. Mandela received huge support from India for his non-apartheid movement and the African National Congress (ANC). It is evident from a statement by the then would-be Jawaharlal Nehru in 1946 that India would not cooperate with South India till the apartheid policy was abolished. He kept the promise by supporting the African National Congress in its demand for the abolishment of the apartheid policy at the international forums including United Nations. During his Presidency from 1994 to 1999, Nelson Mandela developed strong relations with India in both political and apolitical terms. Once he stated that India deserved a place of glory among the closest allies whose contribution to the abolishment of the apartheid and the making of South Africa was undeniable as well as immeasurable. He owed his relations with India to none but Mahatma Gandhi. Both Gandhi and Mandela sacrificed, endured and suffered a lot for their movement for noble causes. Both of them led their respective nations to the dizzying heights of glory through their humanitarian principles and philosophy. They were subjected to imprisonment during the course of their political career. The most remarkable similarity between Mandela and Gandhi is their imprisonment at the Fort Prison in Johannesburg. Though the World has gained but sadly mourns the departure of Mahatma Gandhi and respectively President Mandela ,let us remain rich of spirit knowing that their universal sense of justice will triumph in the end. Thanks for the beautiful comment! Yes but don’t forget … without the White policies against these people in S. Africa there would not have been a so called Mahatma or Mandela … so please don’t forget the Whites either. A controversial new book by two South African university professors reveals shocking details about Gandhi’s life in South Africa between 1893 and 1914, before he returned to India. It is so proud to know about The Great leaders like Sir Nelson Mandela And Other great leaders who were inspired by the Mahatma Gandhiji ‘s Principles .What a great leader. There are still many leaders who are not know by all. Thank you the Great leaders Who Risked and Sacrificed your life for us all in the world . Many all your souls rest in peace.